Indians roaming about the country at that time and it did not take long for those in Jones County to learn that while there was space left on the Secrest floor, if they asked for shelter on bitter nights, they would be allowed to roll up in their blankets and sleep, in front of the big log fire. Two of Joseph Secrest’s daughters, Sarah Elizabeth, and Margaret Minerva Ann, went from his academy to Cornell College in Mt. Vernon, a village some twelve miles from Fairview. 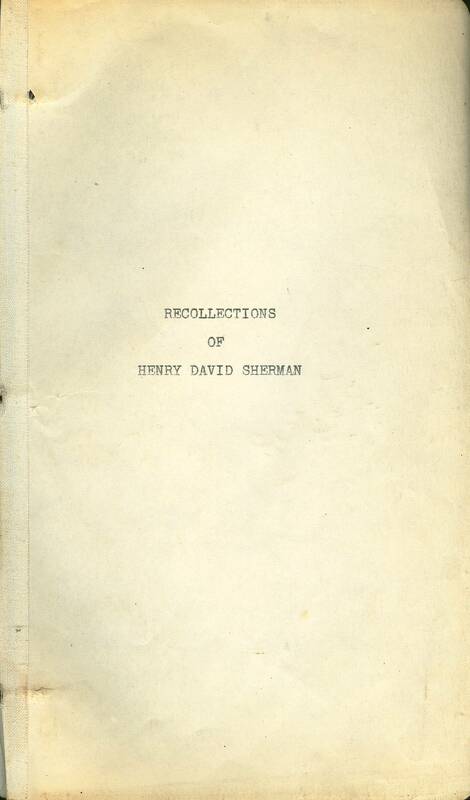 They had been raised by a father with positive opinions, a staunch Democrat whose sympathies were entirely with the South when the terrible crisis came that rent the Union. Feeling ran high in Cornell as the boys in the upper classes enlisted in the northern army. 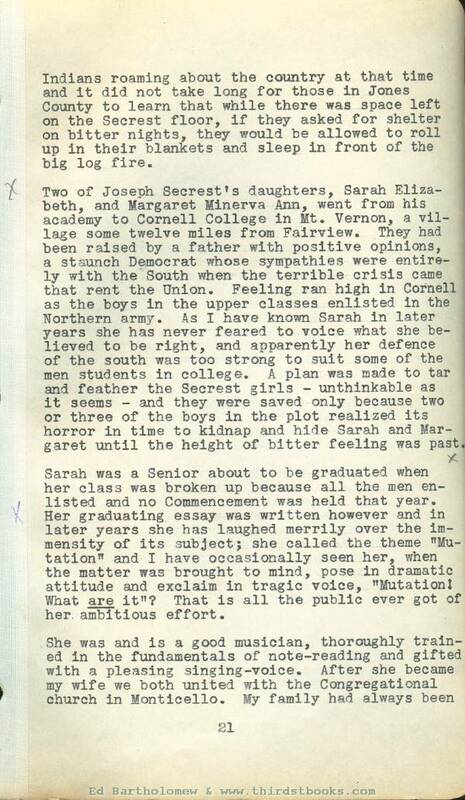 As I have known Sarah in later years she has never feared to voice what she believed to be right, and apparently her defence of the south was too strong to suit some of the men students in college. A plan was made to tar and feather the Secrest girls - unthinkable as it seems - and they were saved only because two or three of the boys in the plot realized its horror in time to kidnap and hide Sarah and Margaret until the height of bitter feeling was past. Sarah was a Senior about to be graduated when her class was broken up because all the men enlisted and no Commencement was held that year. Her graduating essay was written however and in later years she has laughed merrily over the immensity of its subject; she called the theme "Mutation” and I have occasionally seen her, when the matter was brought to mind, pose in dramatic attitude and exclaim in tragic voice, "Mutation! What are it"? That is all the public ever got of her. ambitious effort. Episcopalians and Sarah's for two generations had been interested in the Christian church movement as led by Alexander Campbell, but neither of these denominations was represented in Monticello and we were glad to join the Congregationalists and work with them. 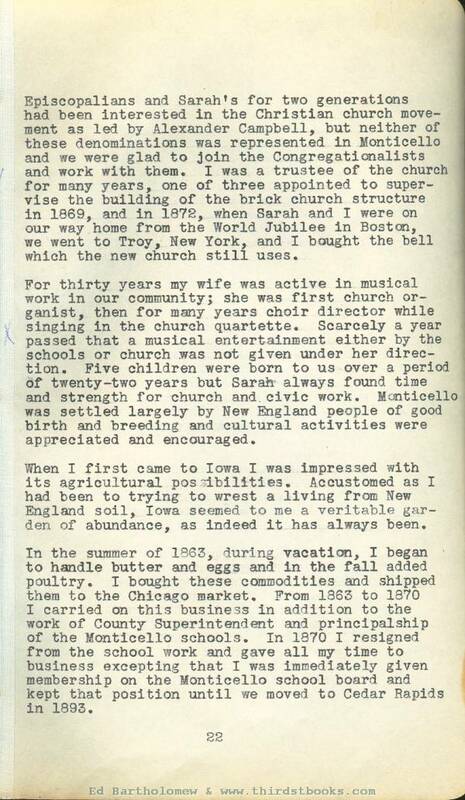 I was a trustee of the church for many years, one of three appointed to supervise the building of the brick church structure in 1869, and in 1872, when Sarah and I were on our way home from the World Jubilee in Boston, we went to Troy, New York, and I bought the bell which the new church still uses. For thirty years my wife was active in musical work in our community; she was first church organist, then for many years choir director while singing in the church quartette. Scarcely a year passed that a musical entertainment either by the schools or church was not given under her direction. Five children were born to us over a period of twenty-two years but Sarah always found time and strength for church and civic work. Monticello was settled largely by New England people of good birth and breeding and cultural activities were appreciated and encouraged. When I first came to Iowa I was impressed with its agricultural possibilities. Accustomed as I had been to trying to wrest a living from New England soil, Iowa seemed to me a veritable garden of abundance, as indeed it has always been. In the summer of 1863, during vacation, I began to handle butter and eggs and in the fall added poultry. I bought these commodities and shipped them to the Chicago market. From 1863 to 1870 I carried on this business in addition to the work of County Superintendent and principalship of the Monticello schools. In 1870 I resigned from the school work and gave all my time to business excepting that I was immediately given membership on the Monticello school board and ; kept that position until we moved to Cedar Rapids in 1893. As my butter business increased I became convinced there should be a better method of making butter for commercial use than as it was done then, made by farmers’ wives under varying conditions with consequent unevenness of product. I had a friend in Manchester named John Stewart. He was also handling butter and I had made his acquaintance in a business way. He was a progressive man, interested in the situation, and as a result of conferences between us it was decided that he should build a creamery in Manchester while I, in company with Mr. H. F. Pierce, would build one in Monticello. Both creameries started operation in the spring of 1876. Their plan was that farmers brought whole milk to the creamery and took home the milk of the previous day from which the butter-fat had been extracted, this skimmed milk was fed to farm stock. The creamery business grew rapidly all over the country. In Iowa Mr. Stewart and I formed a State Dairy Association. He was its first president, later I held that office for many years. 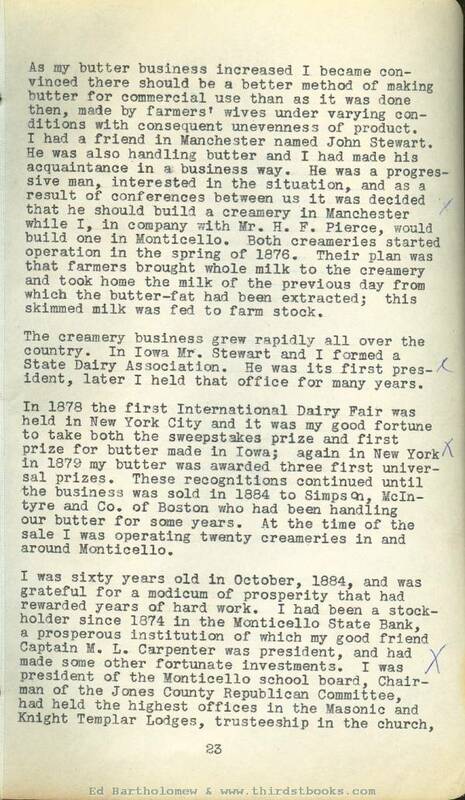 In 1878 the first International Dairy Fair was held in New York City and it was my good fortune to take both the sweepstakes prize and first prize for butter made in lowa; again in New York in 1879 my butter was awarded three first universal prizes. These recognitions continued until the business was sold in 1884 to Simpson, Mclntyre and Co of Boston who had been handling our butter for some years. At the time of the sale I was operating twenty creameries in and around Monticello. Through the years from 1881 to 1884, through the influence of G. W. Simpson, I invested some $t34500 in a cattle and horse ranch in Colorado. Years passed, there were no returns from the investment and the business was finally liquidated in 1898 paying out thirteen percent of the capital invented. This seemed a hard blow but even so we have been able to live in comfort and care for our family. During the years I was in the creamery business there came to be a great deal of adulterated butter put on the market. It was sold as genuine butter but was made by using a neutral lard for fat. I had been active in getting public opinion roused against this practice and instrumental in having legislation passed to protect honest-butter makers from competition with the fraudulent article. In 1886 Governor William Larrabee appointed me Iowa's first Dairy Commissioner, which office I held four years. 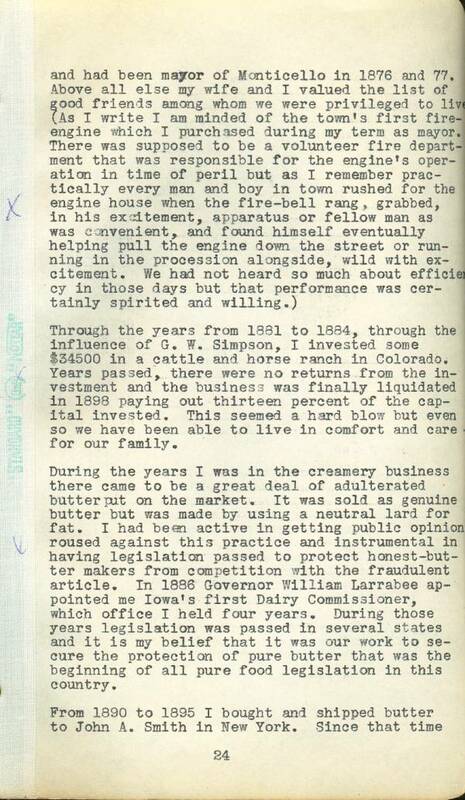 During those years legislation was passed in several states and it is my belief that it was our work to secure the protection of pure butter that was the beginning of all pure food legislation in this country. I have not engaged in active "business. Two of our children had married in 1892 and were living in Cedar Rapids. We had. two little girls still to educate and it seemed a good plan to move to a larger town that offered wider educational facilities so we too came to Cedar Rapids in the spring of 1893. 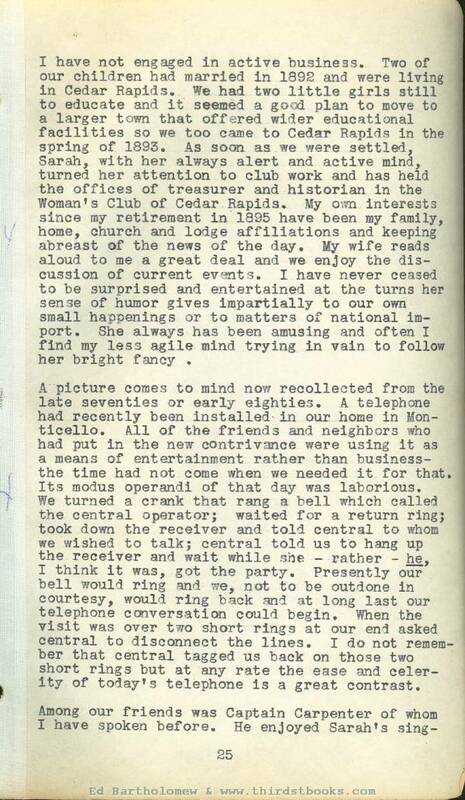 As soon as we were settled, Sarah, with her always alert and active mind, turned her attention to club work and has held the offices of treasurer and historian in the Woman's Club of Cedar Rapids. My own Interests since my retirement in 1895 have been my family, home, church and lodge affiliations and keeping abreast of the news of the day. My wife reads aloud to me a great deal and we enjoy the discussion of current events. I have never ceased to be surprised and entertained at the turns her sense of humor gives impartially to our own small happenings or to matters of national import. She always has been amusing and often I find my less agile mind trying in vain to follow her bright fancy . A picture comes to mind now recollected from the late seventies or early eighties. A telephone had recently been installed in our home in Monticello. All of the friends and neighbors who had put in the new contrivance were using it as a means of entertainment rather than business - the time had not come when we needed it for that. Its modus operandi of that day was laborious. We turned a crank that rang a bell which called the central operator; waited for a return ring; took down the receiver and told central to whom we wished to talk; central told us to hang up the receiver and wait while she - rather - he. I think it was, got the party. Presently our bell would ring and we, not to be outdone in courtesy, would ring back and at long last our telephone conversation could begin. When the visit was over two short rings at our end asked central to disconnect the lines. I do not remember that central tagged us back on those two short rings but at any rate the ease and celerity of today's telephone is a great contrast.